Step up to SSD speeds and inject new life into your laptop or desktop PC with a cool, quiet solid state drive from SanDisk. 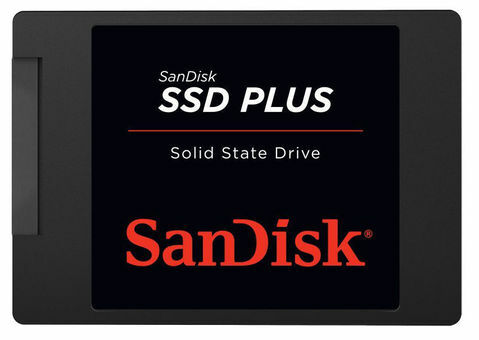 With a fast, reliable SanDisk SSD Plus, you’ll experience quicker boot up and shut down, quicker application response and data transfer speeds than with a typical hard disk drive**, at just a fraction of the cost of a new computer. It’s shock and vibration resistant** so it’s more durable, too. Sequential read speeds of up to 520MB/s** mean faster boot up, faster application response, faster data transfer and better game playing than you’ve experienced from your laptop or desktop before. Available in 120GB and 240GB** capacities, SanDisk SSD Plus gives you plenty of room for your big media files and applications—photos, videos, music, games and more. With no moving parts, your SanDisk SSD keeps your data safe even if you drop your notebook or tablet, while also running cooler and quieter than a typical notebook or tablet. It’s resistant to vibration and temperature fluctuations**. Plus, long battery life means a longer leash and higher productivity for your notebook or tablet, on the go.